At Leviton, we believe color makes the room! This applies not only to the color of the devices you choose to install but to the color and degree of brightness of the light emitted from the bulbs you select. In examining today’s light bulbs, or lamps as they are called in the industry, it is clear that all bulbs are not created equal in terms of the light they emit. Consumers are used to purchasing bulbs in increments of Watts – 40, 60, 75, 100. These are the numbers most of us are familiar with because incandescent bulbs once dominated the market. Today, with the phase out of incandescents, we see LED bulbs with “wattage” listed as 10, 19 etc…and even the elimination of “wattage” for the preferred “lumen”, which at 450, 800, 1,100 etc…gets very confusing if all you want to do is replace a 75W incandescent bulb with its LED equivalent. but consume less electrical power, saving energy and money. Getting back to basics will clear everything up. To start, the brightness of a bulb is measured in lumens. The higher the lumen value the brighter the bulb. Both bulbs will emit the same “color” because the Kelvin units are the same. However, the lumen output – the brightness – will differ. The 500 lumen bulb delivers less light than the 1180 lumen bulb. In watt talk, a 40W bulb delivers less light than a 75 watt bulb. Note that now there are new LED bulbs coming out that can dim to lower Kelvin values as the Lumens go down. So, for example, at full brightness a bulb will produce 2700K but when dimmed to the lowest level it will produce 2400K. Now, about the color of your devices. Gone are the days when white, white and white made up the color palette for switches, dimmers and outlets. Today homeowners can find these devices in a wide array of colors to match or contrast with walls or décor. Leviton takes this one step further with Renu®. The Renu® collection of switches, dimmers and outlets comes in a palette of 20 designer colors to match any room in the home. But, that’s not all. 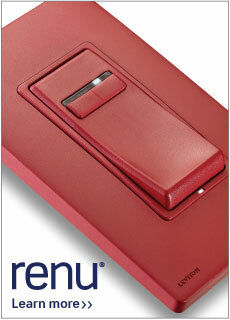 Renu® device colors can be changed in a snap – literally! The device faces are designed to be interchangeable so you can easily swap out one color for another and even mix and match colors for a real personal touch. This is the ideal solution for homeowners who enjoy updating the look of their home for the season, to match a new accent piece, or just because. Here’s how it works. Plus, Renu® has a unique tongue and groove design, making multi-gang applications a snap as well! 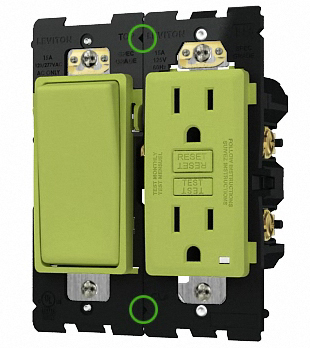 The devices are easy to line up and set in place for a perfect installation every time. In the end, combining the perfect device color for every room with the ideal light output and color temperature can create a designer look throughout your entire home.